Because I said I would is a social movement and nonprofit dedicated to the betterment of humanity through promises made and kept. Their goal is to build a community of people who are driven to help others through the strength of determination. Regardless of your age, gender ethnicity or profession, we all understand the importance of a promise. A promise is elemental to humanity. Alex Sheen would come to realize this after a tragedy in his life. On September 4, 2012, Alex would hold his father's hand as he passed away from small cell lung cancer. Alex was asked to deliver his father’s eulogy. His father’s best quality was being a man of his word. When his dad promised, he delivered. At his father’s funeral, Alex spoke about the importance of a promise and delivered a eulogy titled “because I said I would” that sparked an international social movement. He encourages people to make commitments on “promise cards” that the organization sends to anyone anywhere in the world at no cost. Since the day Alex’s father died, the organization has distributed over 1.3 million because I said I would promise cards to over 105 different countries. As the youngest manager of an international enterprise software company, Alex submitted his resignation in order to advance because I said I would’s philanthropic mission. Alex believes in leading by example and makes his own promises to help others. He raised money to send 100 kids with cancer to Disneyland. In the wake of Hurricane Sandy’s devastation, he drove through the night to New York City with disaster relief supplies to help those in need. In the summer of 2013, Alex walked over 240 miles across the entire state of Ohio in 10 days. This was part of a promise he made to raise funds for Amanda Berry, Gina DeJesus and Michelle Knight, the three Cleveland women who were kidnapped and held captive for 10 years. Through the stories of his promises, Alex has inspired individuals to make life-changing commitments to self-improvement and the betterment of humanity. Alex delivers passionate and thought-provoking speeches about the importance of keeping promises to audiences across the country, with 100% of the proceeds going to fund the work of this nonprofit organization, like volunteer projects, awareness campaigns, character education programs in schools, and teacher resources provided at no cost. He is a two-time TEDx speaker and his work has national headlines on ABC World News with Diane Sawyer, CNN, TODAY, The Los Angeles Times, Steve Harvey, NPR, and many other programs. 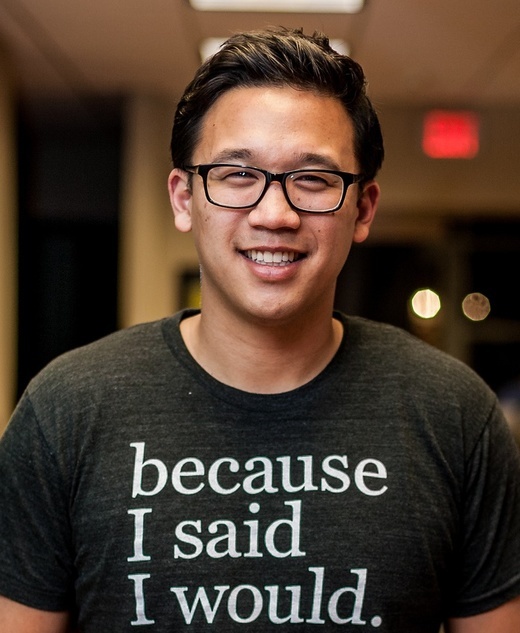 But Alex Sheen believes that every individual has the strength to become a person of their word. humor, and inspiration as he tells deeply moving stories from the because I said I would movement. Alex also shares moments from his personal journey launching and building this viral social movement. Alex expertly employs video media and visually striking imagery to keep audiences engaged throughout his keynote. His keynote concludes with a strong call to action that connects the Promise Card to the personal lives of each audience member. Every person attending the keynote then receives 10 Promise Cards at no cost. both book a world-class keynote speaker and effectively donate to a high-impact nonprofit! From top to bottom, our staff have "because I said I would" cards taped, tacked and displayed in cubicles and offices to showcase how we have made and kept commitments. We have Alex to thank for that. Every client is important, and every promise to them is just as important. By listening to the inspiration of Alex Sheen on stage, and how he continues to keep his promises, it reminds all of us in the audience to do the same. I can’t commend both the performance he has just given and indeed the work he is doing on the philanthropic agenda enough. Absolutely fantastic. Really great response from the participants and I think it has really made them think. His message would motivate all ages to ‘Do what you can, with what you have’ – if you have not heard him speak, BOOK HIM NOW! Alex shared his story with our audience of over 6,500 critical care nurses with passionate delivery. His message really resonated with our community and the opening general session was one of our highest rated ever. It truly set the stage for a terrific conference. Our members cannot stop raving about the presentation.